…otherwise known as “roast what you have” bowls. This week (again) was all about quick cooking, olympic watching, and dinners that fit into one bowl. Which sounds super lazy, but I just know that I’ve burnt more than a few calories anxiously watching athletes go for gold. Anxiety is an ab workout right? This TV “workout” was fueled by some roasty-toasty broccoli and sweet Farmhouse carrots that I happened on hand. I completed the meal with the help of some pantry ingredients: chickpeas, jarred roasted red peppers, tahini, etc. 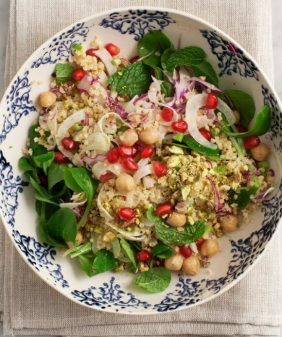 Feel free to switch up the vegetables and add some sort of grain if you like – quinoa or millet would bulk this up a bit more. We’ve been trying to eat a bit lighter lately so I piled the veggies onto a few handfuls of spinach. Make the red pepper sauce (up to a few days) ahead of time and this is a pretty quick 1-pan dinner. 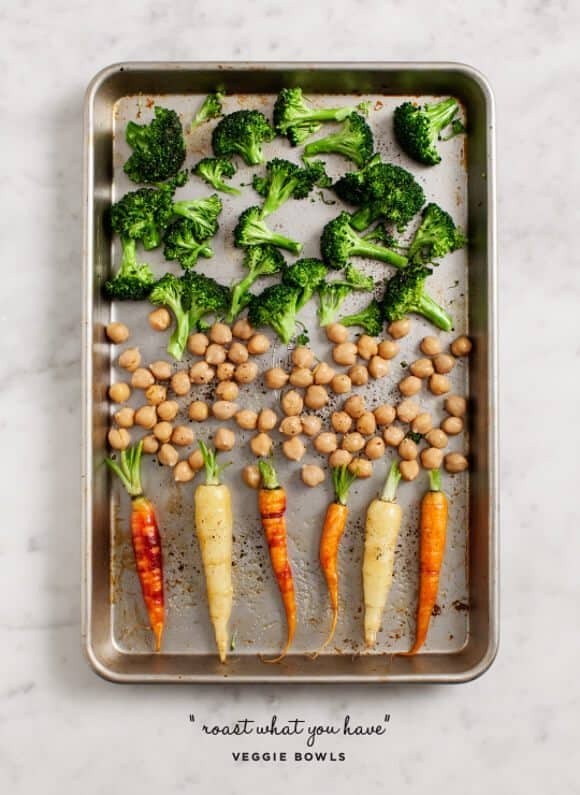 Place vegetables and chickpeas on a large baking sheet so that they're not touching too closely (use 2 sheets if you have to). Drizzle and toss with olive oil, salt and pepper. Roast until golden brown (20-30 minutes total, but take a look after the first 20 - remove the broccoli first if necessary). Make your red pepper sauce by pureeing all sauce ingredients into a high speed blender. Add water until the consistency is thinner than hummus. Taste and adjust seasonings. 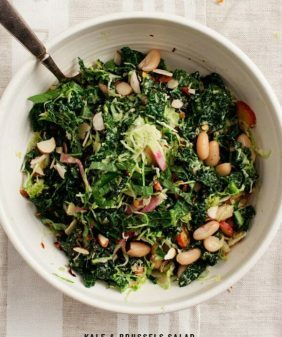 Place raw spinach in serving bowls, dress with a little bit of olive oil, a squeeze of lemon, salt & pepper. Top with the warm roasted vegetables (so the spinach will wilt just slightly) and a dollop of sauce. Store extra sauce in the fridge - it's also great as a sandwich spread or a veggie dip. This whole recipe contains 1 can of chickpeas - I used less than 1 can for the sauce so I'd have extra to roast whole. Blanching almonds sounds fussy but it's pretty easy. Dunk them in boiling water for 30 seconds, transfer to a bowl of ice water and peel the skins (doesn't have to be perfect). Alternatively - you can skip the blanching and soak the almonds so they'll be softer to puree. For easy cleanup, the vegetables can be roasted on foil. Sounds like my perfect winter dinner and I’m sure it lets you sleep well too! Maybe a side of soup to go with? Great idea! definitely 🙂 I love having leftover soups in the freezer to pull out for these kinds of easy dinners! Your photos give me the chills! Gorgeous. Also, any recipe that uses harissa is a winner in my book. Extra spicy, preferably. aw, thank you! I know, I’ve been using harissa a lot lately, love the spice! I adore bowl foods and broccoli! 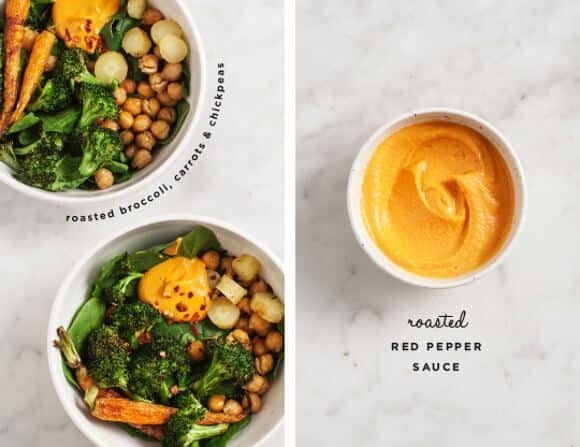 These loaded veggies bowls are my dream dinner! Thanks Shivani – I’m so glad! Welcome! So is the sauce essentially hummus? Could your photos be any more amazing!?! And I love the romesco, hummus, North African fusion spin on the sauce, it’s right up my alley. And no, I don’t think this is lazy. 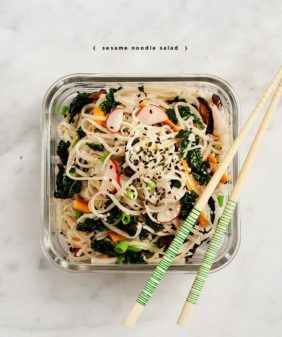 For some reason bowl meals like this are very inspiring to me, and I’m sure to others as well. I make them all the time as well. Totally gorgeous, Jeanine. I love roasted broccoli but don’t roast it nearly enough. You had me at roasted broccoli! This looks absolutely fantastic, and I have everything called for already in the house… except for broccoli. Figures. Looks like a Sunday broccoli run is in order. This WILL be lunch! Yum yum! The sauce reminds of romesco which I love but lightened up a bit with the chickpeas. Oh my this sounds amazing. And that first photo…. swooooon. So good!! 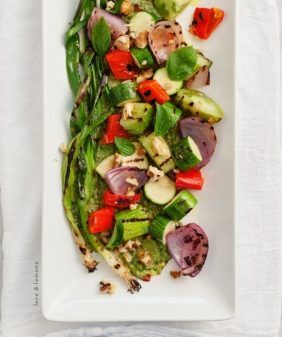 I adore salads with roasted vegetables. beautiful pics. Looks like a yummy snack to watch the Olympics with. The hummus looks like it’s easy to make! yuuuummmmm that looks/sounds great! also, that shot would totally fit with things arranged neatly. so pretty. Totally an ab work out watching the Olympics. Hahaha. you are way too kind :). Thank you, this comment totally made my day! There can never be too many simple recipes! 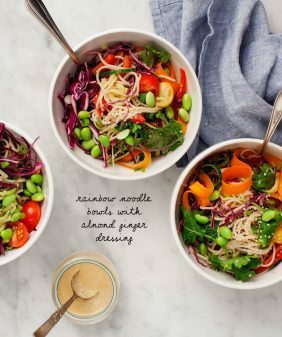 As long as it’s loaded with veggies and lathered in a flavorful sauce then I’m sold (and this recipe more than covers both). Damn straight! I feel like anxiety burns more calories than going to the gym!! what a yummy mix of good for you treats. after eating a whole jar of sugar covered pecans I need this meal!! I loved watching the Olympics but I am glad they are over. Back to normal programming! 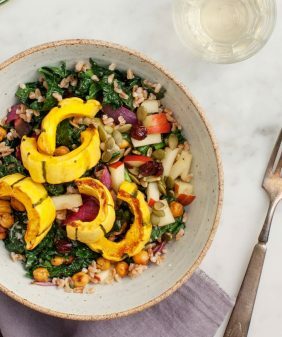 We eat dinner at the coffee table most nights so meals in bowls that are healthy are totally my jam! I made this last night and it was so easy and delicious! I didn’t have any harissa on hand, so I substituted a mix of cumin, chili powder, and paprika for some spice. Looks great! Is there a sub for the harissa? any spices you like really – cumin, coriander, paprika and/or chile powder would all work well! I absolutely adore the playfulness in your photos! Super delicious! I haven’t quite won over daughter yet, but husband approves. Thanks for sharing!